One of the key initiatives of the Burford Institute of Music has been to encourage the younger members of the community to learn an orchestral instrument. 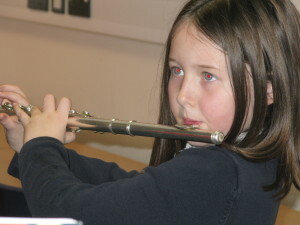 The Institute provides a central venue for primary pupils in the area to meet each week to attend music lessons after school and then play together as an ensemble. This initiative, established in conjunction with the Oxfordshire County Music Service, (www.oxfordshire.gov.uk/music) enables any child to learn an orchestral instrument at an early age as well as giving them the opportunity to share the enjoyment of playing music with others right from the start. Pupils are transported by minibus from their primary schools on a Monday after school each week during term time. They receive a music lesson lesson and at the end of the session they then have the chance to play in an ensemble. ‘Wrap around’ care is provided by a member of Burford school staff from their arrival at 4.00pm. Whilst they are waiting for their lesson students can do any homework they may have, play board games and they also have access to computers where they can use a music based programme called ‘Charanga’. Once a term all students take part in a short performance in the Drama Studio to which parents are invited. Some of the teachers who provide the tuition for the Burford Institute primary school children are also peripatetic teachers at Burford School so there is continuity of experience for those who choose to follow through their secondary education with us. In addition they will be able to continue benefitting from the opportunities provided by the Burford Institute of Music right through to Year 13 and enjoy a uniquely special and valuable experience of music throughout their school life. Parents of primary school children who would like their child to learn an instrument should initially contact the Music Department at Burford by emailing BIM@burford.oxon.sch.uk. We can then arrange a visit and answer any questions you may have.